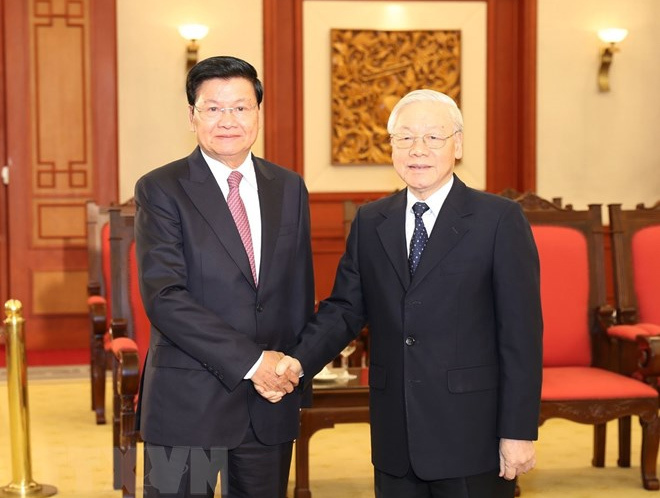 General Secretary of the Communist Party of Viet Nam (CPV) Central Committee and President Nguyen Phu Trong in Ha Noi on January 6 received Lao Prime Minister Thongloun Sisoulith. At the reception,ThonglounSisoulithexpressed his belief that under the leadership of the CPV led by the General Secretary, the Vietnamese people will reap greater achievements in the renewal process and successfullyrealisethe Resolution adopted by the 12th National Congress of the CPV. Informing the host about the outcomes of the 41st session of the VietNam-Laos Inter-Governmental Committee,Sisoulithaffirmed that the Lao government will continue working closely with the Vietnamese government to direct ministries, agencies and localities effectivelyrealiseagreements reached by leaders of the two Parties and countries as well as commitments at the 41st session. In turn,Trongcongratulated Laos on its important domestic and foreign achievements over the past three years of implementing the Resolution of its 10th National Party Congress and expressed his delight at the deepening VietNam-Laos relations. He spoke highly of the coordination between the Prime Ministers of VietNam and Laos in directing ministries, sectors and localities to effectively implement the high-level agreements between the two Parties and States during the recent past. Mr.Trongalso highly valued the outcomes of the 41st session of the VietNam-Laos Inter-governmental Committee, describing them as a very important basis for the two countries to successfully implement the agreement on the cooperation plan between the two governments in 2019, as well as the Viet Nam-Laos cooperation agreement for the 2016-2020period. He asked the two governments to join hands in directing their ministries, sectors, localities and firms to actively implement the agreements reached at the session, focusing on the exchange of information and experience in Party building, socio-economic development, close collaboration in nationaldefence-security and foreign affairs, and seek ways to untangle the knots so as to improve the effectiveness of the cooperation in economy, investment, trade, culture, education, and science and technology. Mr.Trongavailed himself of the occasion to extend his warm regards and New Yeargreetings to Lao Party General Secretary and PresidentBounnhangVorachith and other high-ranking leaders of the Lao Party and State./.